Prepare vinaigrette by blending all the ingredients in the blender at medium speed for 2 to 3 minutes. Refrigerate. Add the lemon juice to the avocado and distribute evenly. Set aside. 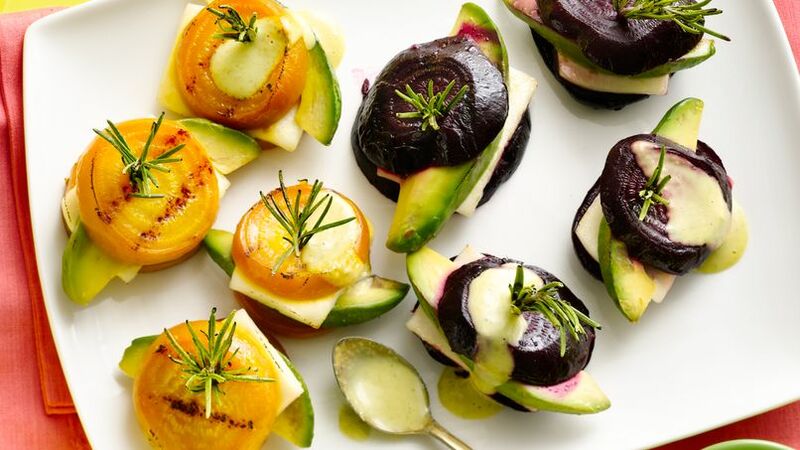 Use a cooking brush to coat both sides of the sliced beets with olive oil. Place a slice of cheese over a slice of purple beets, then a layer of avocado and finish with another slice of beets. Insert a wooden toothpick through the center to hold all the ingredients together when you put it on the grill. Repeat the same process with the rest of the beets. Grill for 30 seconds on each side. Be very careful when you turn it over so it doesn’t fall apart. Coat with the vinaigrette and serve hot. If you can’t find yellow beets, just use the purple ones. You can substitute Monterey Jack cheese for panela cheese. Blanca Arroyo Verde que te quiero verde. What is it? Avocado! Yes, avocado (considered a fruit by many) and beets, a root vegetable, are two of my favorite foods. I can eat them every day without getting bored – in juices, shakes, salads, soups and many other dishes. My liking for them led me to create this recipe, which I’m sure you and your whole family will love.